Reports of Revolver Taco Lounge’s closing at the end of the year were among 2015’s biggest taco stories. Lovers of the Fort Worth, Texas, gem suddenly presented with trichotillomania. The future of the critically and popularly praised taqueria was in doubt, but then came word that Regino Rojas, Revolver’s owner, was going to move operations to Dallas’ Deep Ellum neighborhood. There was a collective sign of relief. When a neighbor asked that I give Tacoqueta a second chance after the taqueria changed ownership as a replacement for Los Torres Taqueria, which closed in late November, I asked whether the tortillas were made in-house as they were at Los Torres. The response was “100 times cleaner, for starters.” Tacoqueta does not make fresh tortillas for its tacos (that craft is reserved for gorditas, sopes and garnachas). I wouldn’t call it cleaner than Los Torres either, as my follow-up visit to the taqueria was met with the stench of sewage mixed with cleaning solution unsuccessfully applied to mask the smell. It was strong. Thankfully, the salsa verde with spurs’ bite heat was stronger. By now you’ve read Texas Monthly’s December issue, “The 120 Tacos to Eat Before You Die,” and you’ve begun sketching an itinerary to scarf them all. 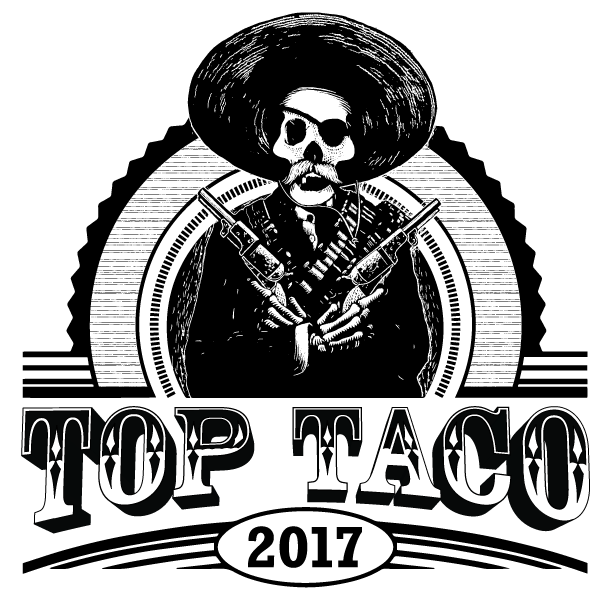 Thursday, December 10, you’ll be able to check off your list Urban Taco’s taco al pastor a la Tuma, one of top 10 tacos in Texas. You’ll do so at the multicourse Agave Trail Dinner at the taqueria’s flagship location on Dallas’ McKinney Avenue. The dinner is something Urban Taco, Lala’s Cakes and myself—a contributor to the issue—along with Texas Monthly have put together to celebrate tacos, Texan and Mexican, and the wonder that are agave spirits. The taco de colita de pavo at Flores Meat Market in El Paso. ¡Saludos! Welcome. 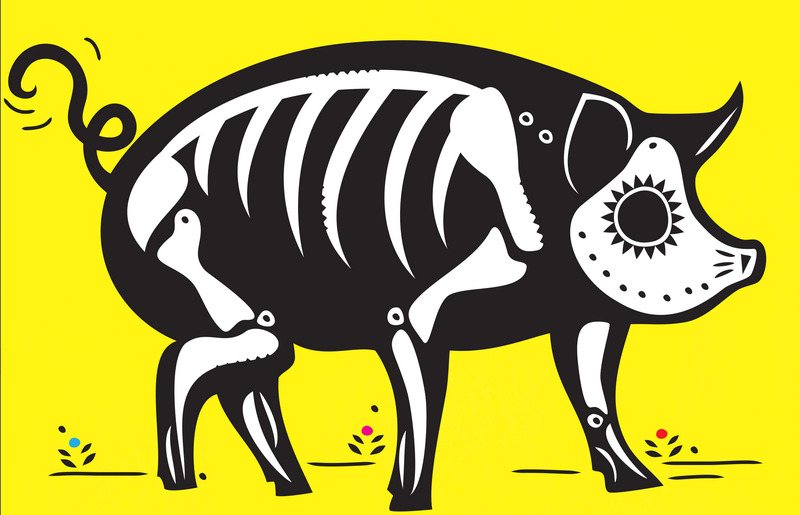 You likely arrived here via Texas Monthly’s The 120 Tacos You Must Eat Before You Die issue. Thanks. 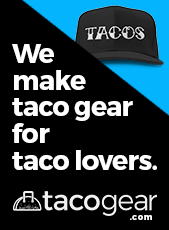 I began working on that editorial package more than a year ago, when Pat Sharpe, the magazine’s food critic, and I initiated a conversation about what form a taco issue would take. Eventually we designed an evaluation sheet (printed in the magazine for your use); set about organizing a team (small but mighty); a schedule (grueling); and what I would contribute (a joyful lot). It was a dream come true for me. I kicked off my exploration of Texas’ taco landscape in 2010, shortly after moving to the state. Initially I focused on exploring Dallas via public transit. Then I widen my scope to suburbs like Richardson and Addison. Fort Worth was next. Along the way, I ate tacos across Austin, where I have family and friends. 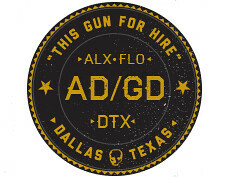 Eventually I set my sights on San Antonio and the Rio Grande Valley. 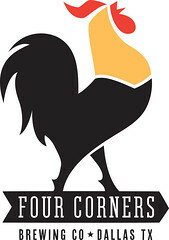 For a couple of years now, I’ve partnered with Four Corners Brewing Co., maker of my go-to IPA, El Chingón, for taco events. I can’t seem to stop. Sharing tacos comes with my job description. The last one was Taco Night, a trompo taco-and-beer fiesta featuring Dallas’ best practitioners of tacos al pastor and tacos de trompo. Next up I’m helping out with Four Corners’ third-annual Dia de los Puercos on Sunday, November 1. Twister Tacos in Odessa is housed in a former fast-food joint building. Taquerias can find homes anywhere the local health department will allow them to set up shop. In the case of Twister Tacos in Odessa, Texas, it’s an old Mexican fast-food spot with a new paint job. The ruined concrete on the front patio remains where it fell, perhaps during a previous incarnation. I imagine it as a result of an AT-AT with a driver in need of his eyes examined. The eyes are deceiving at Twister Tacos. 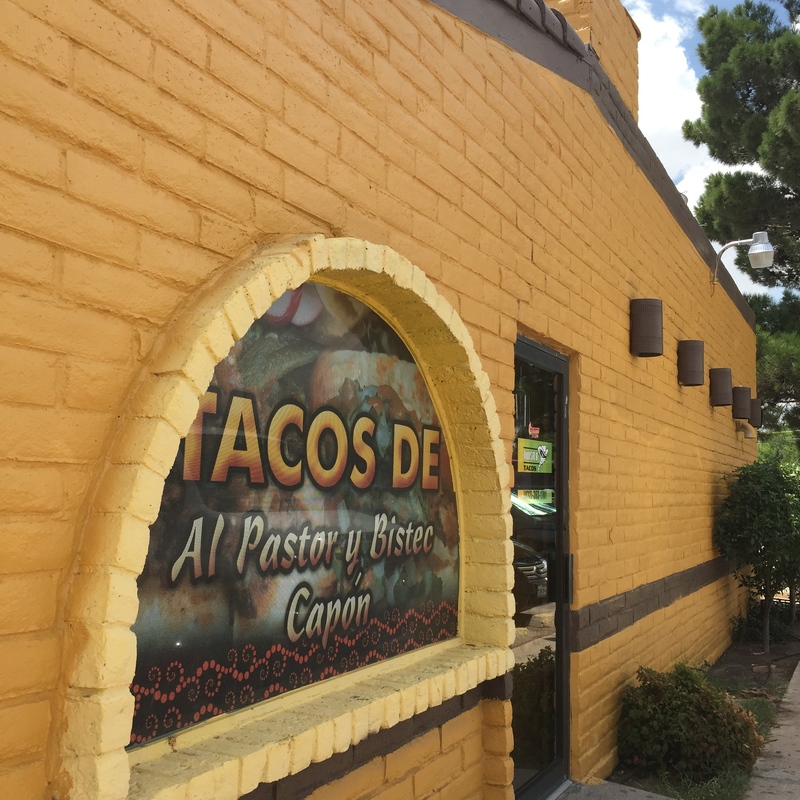 The 11-year-old taqueria, whose current owner took over for her sister in January, advertises tacos al pastor straight from the trompo, but no trompo is visible on the premises. When I asked about the contraption, the owner’s daughter, who was running the cash register, stalled answering and when she did answer, her speech trailed off into mumbling. The look of the pork filling deepened my doubt of the al pastor’s provenance. It looked more like pork chop resting in house-made chewy, flavor-neutral corn tortillas. More taco talk, this time with mezcal. Because I can’t stop when it comes to tacos, later this month I’m involved in a panel that will discuss the history and future of tacos in Dallas. The panel will be moderated by Lesley Téllez, award-wining food writer, former Dallasite, and author of Eat Mexico: Recipes From Mexico City’s Streets, Markets and Fondas. Tickets are on sale now and include all-you-can-eat tacos. More information is below. From the cash-only hole-in-the-wall joint to the fancy taqueria, Dallas is obsessed with tacos. But how did they get here? How have they gone from crunchy shell to gourmet fillings? And why? What’s next for the street snack? 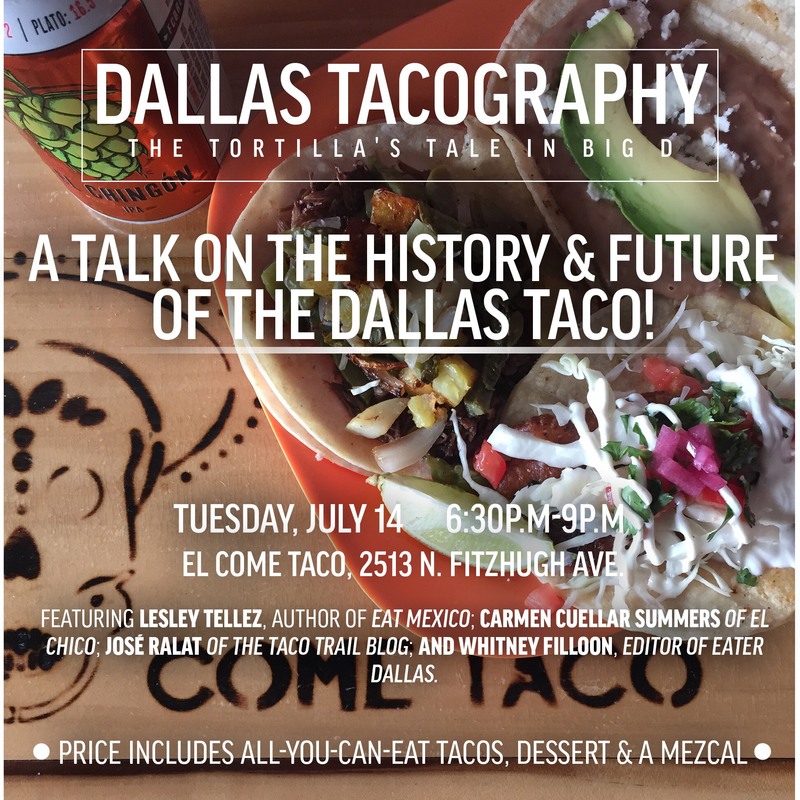 The panel discussion Dallas Tacography: The Tortilla’s Tale in Big D at El Come Taco on Tuesday, July 14, will tackle those questions and more. With all-you-can-eat tacos. Moderating Dallas Tacography will be Lesley Téllez, award-winning food writer and former Dallasite, and author of the new cookbook Eat Mexico: Recipes From Mexico City’s Streets, Markets and Fondas, released in June by Kyle Books. The book is a culinary love letter to one of the biggest cities in the world, with more than 100 recipes and beautiful on-location photography.